The guys at the AK Operators Union tested out the PTR Industries PTR-32 KFR Gen 2 rifle. This rifle has a delayed blowback roller-lock system and comes in 7.62x39. Think of it as an HK-91 but in 7.62x39. My nephew and I had an opportunity to test fire a prototype of this rifle back in the summer of 2014 when we visited the PTR Industries factory in Aynor, South Carolina. What impressed me about the rifle was that the designers at PTR were working to make it take any AK magazine. According to the comments here, they pretty much succeeded with their Gen 2 version. I stumbled across this infographic on AKs this morning. It shows the defining details of the various AKs and how to tell them apart. When I thought about posting it here, I said why not. AKs are the most produced rifle in the world or it may just be a recognition that Vladimir Putin, the despot running Russia, is more effective on the world stage that Barack Obama, our wannabe despot. All that Colion Noir knew about guns six years ago, he'd learned from TV or the movies. He never learned anything about it in school and that would include firearm safety. However, six years ago a friend took him shooting for the first time and his life changed. In this episode, Colion Noir describes that first time and then takes a female friend to the range for the first time. We often pass around the phrase, "Take someone shooting", but we need to do it. It is the best inoculation against the lies told by the Shannon Watts of the world. The Citizens Committee for the Right to Keep and Bear Arms notes that while President Barack Obama wants more gun control, his administration is less likely to prosecute violations of existing law. The CCRKBA was responding to this report released yesterday by the Transactional Records Access Clearinghouse. Interestingly, the Southern District of Illinois was one of the top ten judicial districts for convictions on Federal firearms charges. I'm not sure how the Northern District of Illinois (Chicagoland) is doing as I don't want to have pay for the data. Nonetheless, it isn't in the top ten! BELLEVUE, WA – While Barack Obama has been pushing harder for more gun laws to disarm honest citizens, his Justice Department has been prosecuting fewer gun crimes despite announcing more than two years ago he would increase such prosecutions, the Citizens Committee for the Right to Keep and Bear Arms said today. According to the Transactional Records Access Clearinghouse (TRAC) at Syracuse University, gun crime prosecutions have been declining since 2013, the same year President Obama began ramping up the rhetoric about more and stronger gun laws as a response to the Sandy Hook tragedy. “After the president spoke yesterday to the International Association of Chiefs of Police in Chicago,” Gottlieb observed, “he took some heat from the Chicago Tribune for not using three important words: Mandatory minimum sentencing. When your hometown newspaper calls you out for essentially being disingenuous about cracking down on armed criminals, your tough talk turns to hot air. “According to the TRAC report,” he continued, “the federal government reported 6,002 new firearms convictions during Fiscal Year 2015. That’s down 5.8 percent from the 6,373 convictions reported in FY 2014, and an alarming 15.5 percent from five years ago, when there were 7,101 convictions. It represents a whopping decline of 34.8 percent from the 9,206 convictions reported in 2005, according to the TRAC data. California Lt. Gov. and former San Francisco mayor Gavin Newsom (D-CA) is sponsoring an initiative to bring even more gun control to the Golden State. However, he isn't doing this without opposition. The Firearms Policy Coalition is working to build grassroots opposition to his outrageous measures which include having to have a permit to buy ammo and a total ban on all standard capacity magazines. SACRAMENTO – In response to the official filing earlier today of California Lt. Gov. Gavin Newsom’s mis-named “The Safety for All Act of 2016,” civil rights advocates at Firearms Policy Coalition (FPC) and the Firearms Policy Coalition Second Amendment Defense Committee (FPCSADC) political action committee have begun shipping out over 25,000 grassroots activism guides to volunteers and activism hubs throughout the state. FPCSADC President Brandon Combs expects to ship an additional 75,000 grassroots guides within the next week. And other gun control regulations that have already failed passage in the Legislature or were vetoed by Governor Jerry Brown. Newsom would need to collect about 366,000 valid signatures to qualify the proposal for the 2016 general election ballot. From there, it would be an up or down vote by the people of California. “All California gun owners and civil rights organizations must stand together, dig in, and do whatever it takes to defeat this anti-rights initiative at the ballot box,” said Combs. You can support FPCSADC, volunteer to fight the ballot initiative, and view the official ballot initiative language at FPCSADC’s StopNewsom.com opposition campaign website, also available at fpcsadc.org. FPC first informed the public about Newsom’s gun control proposal on October 14, the day before the Lt. Gov. held a press conference to announce his plan. For the first time, an international team of snipers has won the annual sniper competition held annually at Fort Benning, GA. A team from the Army Ranger Wing ('Sciathan Fíanóglach an Airm') of the Irish Defence Forces (Óglaigh na hÉireann) won the 15th International and U.S. Sniper Competition. The Army Ranger Wing is the special forces unit of the Irish Army. The competition featured teams (shooter and spotter plus team coach) from around the US military plus international teams from the UK, Denmark, Canada, Germany, and, of course, Ireland. Also there were teams from the FBI plus two Georgia police departments. The event was held October 19th through 23rd. Capt. Nick Privette, commander of the US Army Sniper Course, describes the skills that the sniper teams would be tested on in this competition. "The Army Ranger Wing have long been regarded as one of the finest Special Forces Units in the world. This victory is testament to their hard training and resolve." Consistency was the key to the win by the Irish whose names and pictures were not released at their request. Col. William Thigpen, commander of the 316 Cavalry Brigade, pointed to consistency as the key to success for the Ireland team over the course of 16 events. Teams were tested in long-range marksmanship, observation, target detection, stalking, reconnaissance and reporting and the ability to move with stealth while concealed. "They demonstrated the most consistency across the board," Thigpen said. The statistics haven't been reviewed yet, but Thigpen said the Ireland team may be the first international team to win the sniper competition. "I'm almost positive this is the first international team to win the competition," the commander said. "We are fair in everything we do. That's how the numbers registered. They were the best team in 2015." Over the years, consistency in shooting has been key for winners. "We found out that over the last couple of years teams that stay within the top five in each event tend to have a better chance in winning the overall competition," Thigpen said. "That's a consistent trend at least over the last three years." The efforts of the Ireland team were noticed by Staff Sgt. Steve Curry and Sgt. Emmanuel Velayo of Camp Pendleton, Calif., who came in third place. "The international teams were quite impressive," Curry said after the ceremony. "The Ireland team did extraordinarily well. They were consistent, they were accurate and they did all the basic things right." Even local Columbus, Georgia TV took notice of the win by the Irish team. After the City of Seattle imposed a "gun violence tax" on sales of arms and ammunition within their city limits, the Second Amendment Foundation, National Rifle Association, and the National Shooting Sports Foundation jointly sued the city. Under Washington State law, cities and counties are preempted from passing regulations that impact firearms. That is reserved for the state. This suit is groundbreaking because it is the first time the three have jointly sued on a gun rights issue. Now comes word that they have moved for summary judgment in King County Superior Court. BELLEVUE, WA – Plaintiffs challenging a so-called “gun violence tax” recently passed by the Seattle City Council have today filed a motion for summary judgment in their lawsuit, citing Washington State’s long-standing preemption statute which “fully occupies and preempts the entire field of firearms regulation within the boundaries of the state.” The motion was filed in King County Superior Court. That case was Chan v. City of Seattle, brought by SAF, NRA and several other plaintiffs. Fogg also argued that case. It derailed an attempt by the city under former Mayors Greg Nickels and Mike McGinn to ban guns in city park facilities. But Washington State’s preemption statute, passed 32 years ago and used as a model by other states to adopt similar legislation, stopped that effort in its tracks. “Seattle is trying to be too clever by half,” said SAF Executive Vice President Alan Gottlieb. “Our motion shows that members of the city council brainstormed with members of local gun control groups to try to skirt the preemption law. This so-called ‘gun violence tax’ clearly seeks to limit access to firearms and ammunition by imposing what amounts to a regulatory fee on the sale of all firearms and ammunition within City limits. The city can’t do that, and we’re confident the court will tell them so. The Huffington Post had a post about HR 3799 - the Hearing Protection Act of 2015 - being introduced by Rep. Matt Salmon (R-AZ). As with most PuffHo articles, it starts well and then goes over the edge. They waited until the 12th paragraph to link suppressors with CIA death squads. In the past, the NRA had been hesitant to get into bed with manufacturers of silencers, largely due to image problems that have long plagued the devices. In 2013, Mother Jones reported on the history of modern silencers, going back to their creation in the late 1960s by a onetime CIA dark-ops contractor, as well as their early use by CIA death squads in Vietnam. The ASA was formed in 2011, suggesting that the silencer industry has lately taken more of an interest in public relations and political influence. Supporters of stronger gun regulations regularly point to the potential hazards of making it easier for civilians to get hold of accessories that -- as manufacturers readily admit -- allow shooters to disguise their location by minimizing the noise and light produced by firing a gun. There's little evidence to suggest that silencers are used regularly in criminal activity, but there have been a number of cases in which gunmen, or would-be gunmen, were found to have used the devices or at least been in possession of them. Hiram Percy Maxim, son of Hiram S. Maxim, was awarded a patent for his Maxim Silencer in 1909. That is significantly earlier than the "late 1960s". Moreover, High Standard produced an integrally suppressed pistol for the OSS as early as WWII. I guess it is only a "death squad" to PuffHo if you are fighting communists and not Fascists. More to the point of this post are the comments by Ladd Everitt of the Coalition to Stop Gun Violence (sic). Ladd Everett, director of communications for the Coalition to Stop Gun Violence, says manufacturers are simply making a financial calculation in the current push to make it cheaper and easier for people to get silencers, despite the potential for misuse. "The NRA and gun industry view accessories like silencers as potential profit areas, with guns themselves so well-saturated throughout their existing customer base. That’s why we’ve seen this multi-state effort to weaken laws in this area, the obvious consequences for safety be damned," Everett told The Huffington Post. "It’s about profit, nothing else." Ladd, dude, profit is what capitalism is all about. Your bio says you worked for US Saudi Arabian Business Council so you of all people should understand that. And what are these obvious consequences for safety that you speak of? As one of the many Americans with hearing loss issues due to damage from shooting unsuppressed firearms without hearing protection, I would think that making it easier to end noise pollution and protect hearing at the same time would be a win-win for safety. I guess since I live out in the hinterlands I'm just a bit clueless what is obvious to you inside the Beltway sorts. Rep. Matt Salmon (R-AZ) has introduced the Hearing Protection Act of 2015. The act would remove suppressors and silencers from the National Firearms Act. In other words, there would be no restrictions (other than state ones) and no $200 tax anymore. You'd only have to go through a NICS check. As someone who has both tinnitus and moderate 4000 Hz notch hearing loss, I fully support this bill. My hearing impairment came as a result of shooting firearms at earlier period in my life without hearing protection. My audiologist told me last week when she checked my hearing that I would need hearing aids in the future. Fairfax, Va.— The National Rifle Association’s Institute for Legislative Action (NRA-ILA) announced its support today for the Hearing Protection Act. Sponsored by Congressman Matt Salmon (AZ-05), the legislation removes suppressors from regulations established under the National Firearms Act of 1934. “Suppressors significantly reduce the chance of hearing loss for anyone who enjoys the shooting sports,” said Chris Cox, executive director of NRA’s Institute for Legislative Action. “On behalf of the NRA and our 5 million members, I want to thank Rep. Salmon for his leadership on this important bill." Prevailing regulations requires buyers to send an application to the Bureau of Alcohol, Tobacco, Firearms and Explosives (ATF), pay a $200 tax, and pass an arduously time consuming ATF background check. Under Salmon’s bill there will be no application, no tax, and buyers would be required to pass the same National Criminal Instant Background Check (NICS) as law-abiding guns owners. As a leading voice in the industry, the American Suppressor Association has provided valuable insight to the creation of the Hearing Protection Act. It is currently legal to hunt with a suppressor in 37 states. 41 states allow private ownership of suppressors. The bill has not been assigned a number yet but I'll update this post when it does. Michael Bane related a conversation he had with someone in the suppressor industry in his most recent podcast. The gist of it was that if suppressors had been invented now instead of the early 20th century, we would be required to have them and we'd be able to pick them up at a corner store. I believe that is correct. I do know that I'll fight tooth and nail for this bill. I don't want today's younger shooters to have to deal with even moderate hearing loss. UPDATE: The American Suppressor Association released a statement on the introduction of this bill. As you can imagine, they are very, very pleased with this bill. UPDATE II: The number of the Hearing Protection Act of 2015 is HR 3799. You can quickly send a letter to Congress showing your support by using this PopVox link. I normally do not report on the Democratic primary unless it reflects on gun rights. However, I got an email on Tuesday with an offer to see the pre-release results of the Topline WBUR survey of likely New Hampshire Democratic voters so long as I didn't release the results before 5am EDT Wednesday. I'm no fool. I jumped on the offer! It looks like that post-Democratic debate that Hillary Clinton (D-carpetbagger) is now back in the lead against Bernie Sanders (D-VT). Even though Sanders and Clinton are essentially tied, the movement by Clinton from 31% to 38% is beyond the margin of error. Margin of error is +/- 4.9 percentage points. The poll did have some interesting tidbits. First, the majority of those polled thought Clinton could win (71%) in the general election while only a minority thought Sanders could win (39%). Clinton's numbers rose significantly from September to October. Second, while the overwhelming majority (80%) thought Bernie Sanders was trustworthy, only a bare majority (53%) thought Hillary Clinton was trustworthy. These numbers stayed consistent (+/- 2% points) between September and October. WBUR Boston has their take on their poll here. You can read the whole poll results here including the questions and methodology. I published Every Picture Tells A Story, Part Three last Wednesday. It was an update of the 2011 post that tracked the spread of firearms freedom as evidenced by the growth in shall-issue and constitutional carry. It was released on October 15th to commemorate the effective date of constitutional carry in the state of Maine. Also published in 2011 was another collaboration with Rob Vance called Every Picture Tells A Story, Part Two which plotted annual FBI violent crime rates against the growth of shall-issue concealed carry. We explicitly stated back then that there wasn't a positive correlation between violent crime rates and liberalized carry laws. We also said that proving a negative correlation would take more a more rigorous statistical approach. However, we took note of Linoge's work regarding the negative correlation between crime involving firearms and gun ownership. I would note that Linoge has updated his work and the negative correlation is even stronger in 2015 (-0.8016) than in 2011. 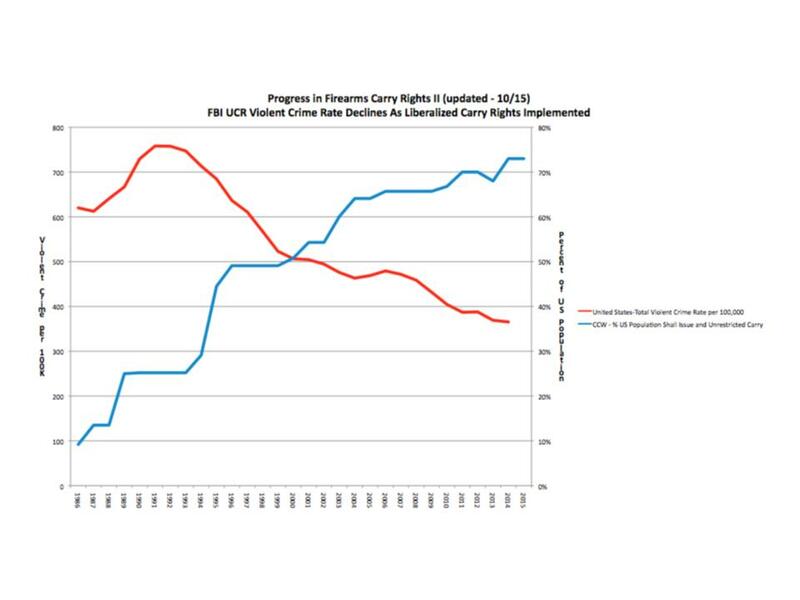 Rob has updated his graph to reflect the changes since 2011 in both crime rates and the growth of shall-issue and constitutional carry. When Illinois, the fifth largest state in the US, was forced to adopt shall-issue concealed carry, the anti-rights movement predicted blood in the streets of Chicago and elsewhere in Illinois. That is, more blood than is normal in Chicago with its long history of stringent gun control. The graph above normalizes the crime rates as per 100,000. If shall-issue concealed carry would have caused an increase in crime rates in Illinois, it would have shown up in the graph. Every time the citizens of our states manage to convince their legislators that individual self-defense via unrestricted or shall issue concealed carry is the best approach, the press repeats the shibboleth that such laws will result in “blood in the streets.” Well, the press has been wrong about that, and they’ve been wrong repeatedly and over many many years. Then again, newspaper circulation is down and this kind of lazy reporting might be one of the reasons why. Violent crime rates, including the murder rates, are down in the United States from a peak in the early 1990’s, but you wouldn’t know it from our press. The diagram below starts with data gathered to demonstrate the change in state laws in favor of no or de minimis regulation of concealed carry of firearms for self-defense (https://docs.google.com/spreadsheets/d/1QxBfs9acTUH8hL1OtkitcivuCzr4IQKjKOQ4_obK61c/pubhtml), and integrates FBI Uniform Crime Reporting data on the national level of violent crime over time. Concealed carry laws matter because they change the balance of power in the favor of law abiding citizens over violent criminals, increasing both the real and the perceived risk associated with criminal behavior. Over the last 25 plus years the rate of violent crimes in the US has fallen substantially, and this change runs directly counter to the increasing availability of concealed carry as a self-defense option for Americans. We are now experiencing lowered rates of violent crime last seen in the early 1970s and murder rates from the mid-1960s. As John Lott has written (extensively I might add), “More Guns = Less Crime.” Correlation isn’t causality is a truth from statistics; yet it is entirely truthful to say that the normalization of armed self-defense is taking place in a period when the rate of violent crime is falling in the US. Any other conclusion does not follow the data. Chicago Mayor Rahm Emanuel plans to waste another $250,000 of the city's money in order to fund a gun buy-back. He announced his plans yesterday at press conference attended by the usual hanger's on. The money is coming from the Chicago Police Department's budget. The "intent" is to "get guns off the street". Emanuel's buy-back will be a partnership between the city and various groups who can apply for grants to fund buy-backs. Organizations can apply directly to the police department and will be responsible for organizing and advertising the events. Chicago police will staff the buy-back events, recover the guns, and provide cash cards for guns turned in. The $250,000 fund will be used to purchase the cash cards, and is funded through the existing CPD budget. The last time the city sponsored such a buy-back gun rights organizations and suburban gun dealers dumped a number of inoperable firearms on the city and collected $100 each in gift cards. John Boch of Guns Saves Lives said the money was used to purchase ammo for a NRA youth camp. Boch said his group will be back and the cops aren't happy. Boch is vowing to return to Chicago with another 50 or 60 guns to turn in. Anthony Guglielmi, spokesman for the Chicago Police Department, said officers will check to see whether turned-in guns are operable but won’t check the IDs of the people who bring them in. No, what Mr. Guglielmi should be asking is whether this $250,000 of taxpayer's money couldn't be better used in enforcement efforts against criminal gangs such as the Gangster Disciples, the Latin Kings, and Black P Stone. When you look at a map of Chicago and see very few areas that don't have known gang boundaries, it is what I'd be asking. The Liberal Party headed by political legacy Justin Trudeau just ousted the Conservative Party of Prime Minister Stephen Harper in nationwide elections yesterday. The Liberal Party took 184 seats out of 338 which gives them a working majority. They will not have to try and form a coalition government with other smaller parties. The Conservatives retain only 99 seats or 29% of the seats in the Canadian Parliament's House of Commons. The only thing positive in that list is the claim that a Liberal government will not create a new long-gun registry. I hate to say it but the next five years are not going to be good ones for Canadian gun owners. Or the rest of Canada for that matter. I read an interesting article by Malcom Gladwell this weekend. It was published in the New Yorker and dealt with how school shootings spread. The central premise is that school shootings are like a riot in that people who may never have considered violence are sucked into it as the violence escalates. But (Stanford sociologist Mark)Granovetter thought it was a mistake to focus on the decision-making processes of each rioter in isolation. In his view, a riot was not a collection of individuals, each of whom arrived independently at the decision to break windows. A riot was a social process, in which people did things in reaction to and in combination with those around them. Social processes are driven by our thresholds—which he defined as the number of people who need to be doing some activity before we agree to join them. In the elegant theoretical model Granovetter proposed, riots were started by people with a threshold of zero—instigators willing to throw a rock through a window at the slightest provocation. Then comes the person who will throw a rock if someone else goes first. He has a threshold of one. Next in is the person with the threshold of two. His qualms are overcome when he sees the instigator and the instigator’s accomplice. Next to him is someone with a threshold of three, who would never break windows and loot stores unless there were three people right in front of him who were already doing that—and so on up to the hundredth person, a righteous upstanding citizen who nonetheless could set his beliefs aside and grab a camera from the broken window of the electronics store if everyone around him was grabbing cameras from the electronics store. I suggest reading the whole article. I know this is "heavy" reading for a Monday morning but it is an important topic and it does have an implication for our gun rights. By now, there have been innumerable stories written on Hillary Clinton's love for the "Australian-style" approach to gun control. Breitbart has it as does The Daily Caller. SayUncle has it as does Sebastian. However, if you still don't know what I'm talking about, here is the video. In it Hillary proposes a "cash for clunkers" approach to firearms. Of course, being a good Democrat I'm guessing she would use other people's money to fund her program. The NRA doesn't think much of her proposal. Even Paul Barrett of Bloomberg News thinks she is making a mistake. I say let her go full gun control. It worked for President Al Gore. Oh, wait, he lost both his home state of Tennessee and Bill Clinton's home state of Arkansas over just this issue. She probably won't lose New York over this but swing states like Ohio, Florida, and Pennsylvannia will go to her Republican opponent along with the election. Wilson Combat made a custom cutaway 1911 for Larry Vickers. In the video below, you can see him shooting it in both full and slow motion. It is fascinating to watch the ejection begin after the hammer has fallen and the bullet is on its way downrange. This is a well put together video. I've watched 2-3 times and I can see myself watching a number of more times. It is only about 3 minutes but is is 3 minutes well spent. I knew yesterday was the first day of constitutional carry in the state of Maine. Rob Vance and I celebrated that with an update to Every Picture Tells A Story. What I didn't know and found out this morning it was the first day that switchblades became legal in Maine. October 15, 2015: Maine' LD 264, "An Act To Restore the Right To Possess Certain Knives That Are Used by Many Citizens as Tools," repealing the state's ban on switchblade (automatic) knives is now in effect. Maine is the ninth state to allow switchblades since Knife Rights started it Sharper Future™ campaign six years ago. Automatic knives are now legal for civilians without restriction in 28 states, and legal with various restrictions in 10 more. Nine of those 28 states have been added by Knife Rights since 2010. Knife Rights passed the nation's first repeal of a automatic knife ban in 2010 in New Hampshire and has since passed repeal of automatic knife bans (and repealed other knife restrictions) in Alaska, Indiana, Kansas, Maine, Missouri, Nevada, Tennessee and Texas. In Oklahoma,this year Knife Rights' legalized concealed carry of an switchblade (automatic) knife which goes into effect on November 1st. Seeing both of these efforts pass gives me hope for Maine. 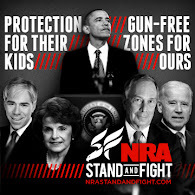 They will be inundated with Bloomberg's money as he and his evil minions try to get a referendum on universal background checks put on the ballot. Mainers are a tough lot and not easily swayed by false emotion. I hope the same will prove true of all the newer in-migrants from places like Massachusetts and New York. Can you believe what those evil Potterfields, Larry and Brenda, have just done? They have actually donated a six-figure sum to their foundation to promote "youth shooting sports". Can you imagine that? Wanting kids to learn how to shoot safely, develop a life-long hobby, and be responsible? Why I bet those kids will even pull up their pants and turn their caps around. If I were Ladd Everitt or Josh Horwitz of CSGV, I would be horrified. As it is, all I can say to the Potterfields is .... thank you. Larry and Brenda Potterfield, owners of MidwayUSA, recently donated $184,045 to the MidwayUSA Foundation to benefit youth shooting sports. This donation stems from the matching program offered by the MidwayUSA Foundation. Donors have the ability to choose the shooting team that will benefit from their donation and Larry and Brenda Potterfield match that donation. The Potterfields have generously committed to a 1:1 matching program administered by the MidwayUSA Foundation through November, 2015. A donation match is made for all funds returned to Team Endowment Accounts that teams generate from MidwayUSA Foundation promotions. A donation match is also made for all private donations and private donors are given the opportunity to designate a specific shooting team to benefit 100% from their donation. In 2014 the Potterfields’ commitment to the MidwayUSA Foundation match program resulted in the donation of over 4.6 million in matching dollars. The quote of the day has nothing to do with gun rights but everything to do with our feckless (and anti-gun) president. It is from Prof. Frederick Kagan of the American Enterprise Institute. Kagan was formerly a professor of military history at West Point. There was no meaningful al Qaeda presence in Afghanistan when Barack Obama took office. There will likely be al Qaeda strategic bases there when he leaves. That is failure by any standard. Four years ago Rob Vance and I collaborated on a post showing the progress of concealed carry from 1986 through 2011. The post was anchored by a graphic that showed the growth in shall-issue carry and constitutional carry as a percentage of the United State population. At that time, approximately two-thirds of all Americans lived in a state that allowed either shall-issue or constitutional carry. In other words, shall-issue had become the new normal as it continues to be. Effective October 15th, Maine becomes the seventh state to have constitutional carry. Rob thought now would be a good time to revisit this advancement of freedom and gun rights. I agree because that two-thirds of all Americans in 2011 has become three-fourths of all Americans in 2015. 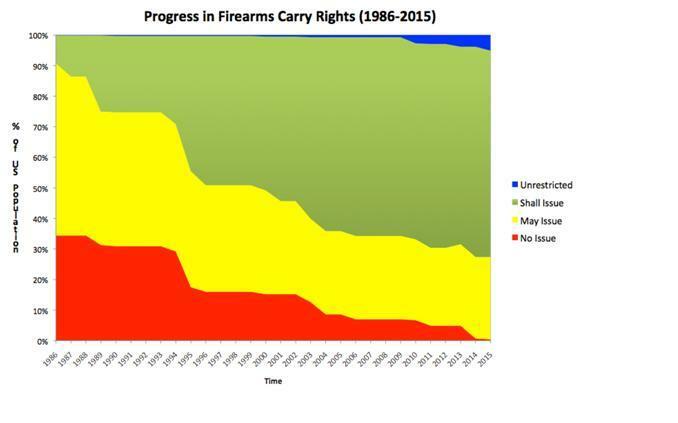 The sea change in the legal status of concealed carry in the United States described below in graphic form follows a still ongoing grass roots effort at the state level, yet with national implications. There is now a fundamental recognition by the American public that giving advantages to criminals over law-abiding citizens, by means of law, is a logical and moral error. This realization has driven the liberalization of state level laws regarding concealed carry since Florida led the way in the modern era beginning in 1987. Twenty-six years later, Illinois became the last state with a de jure ban on concealed carry – passing “shall issue” legislation allowing legalized concealed carry for its citizens as a result of losing Moore v. Madigan and Shepard v. Madigan in the 7th US Circuit Court of Appeals. First permits under the new law were issued in 2014 in that state. The restoration of this fundamental freedom will continue by legislation where we can and by litigation where we cannot. The two biggest changes shown in the graphic below are the addition of Illinois to the shall-issue column and the growth of constitutional carry from just two small states (Vermont and Alaska) to a total of seven today. Rob and I are working on an update to Every Picture Tells A Story, Part Two as well as new effort called The Next Wave. This new effort will examine the growth of constitutional carry and its chances in states where it has been introduced but either not passed or vetoed by the governor. Given that neither Rob nor I believe in hiding our data nor how we put things into categories, you can see it in this appendix. Hawaii (the legal status of Hawaii is such that while permits are legally available, none are issued, which is why it is counted as No Issue in this analysis, rather than fitting into the May Issue category which it’s legislation warrants). SHALL ISSUE: permit required but the state is obligated to issue a permit if the applicant meets certain criteria (age, no felony record, no drug arrests, etc. ); i.e., the state has no discretion. MAY ISSUE: permit required but local authorities (e.g. sheriffs’ offices) have discretion in the form of requirements above and beyond what the state requires. Thanks also to Jeff Dege at http://www.gun-nuttery.com. I probably should have looked for the Brady Center's response to the outcome of the Badger Guns' case but just didn't want to hear them gloat. There are some things there were not said in the press release below. First and foremost is the fact that Brady Center attorneys Jonathan Lowy and Alla Lefkowitz were removed from the case and censured by the Wisconsin Supreme Court for legal improprieties. Second, the "89 people dying every day from guns" statement by Dan Gross gives the impression that all 32,000 plus of those deaths were the direct result of the illegal use of a firearm as well as that firearm being sold improperly by a Federally license dealer. However, the reality is that that number includes suicides, hunting accidents, criminals shot and killed by the police, and, yes, people who were murdered. According to the latest mortality data from the CDC, there were 11,208 homicides using a firearm in 2013. There were 41,149 self-inflicted deaths in 2013 of which about half involved the use of a firearm. As Dan Gross and the coterie of public health researchers in the pockets of the anti-rights movement know, adding suicide numbers grossly distorts the real issue. Third, the use of the term "gun companies" gives the impression that a straw purchase is the fault of the manufacturer. This, of course, is incorrect. In this case, if the FFL was truly negligent, then the Protection of Lawful Commerce in Arms Act worked as intended because negligent acts are not protected by it. WASHINGTON, DC – In a landmark decision, a Milwaukee jury yesterday found Badger Guns responsible for the illegal sale of a gun that was used to seriously injure two police officers. Lawyers from the Brady Center to Prevent Gun Violence brought the case in 2010. Until now, the 2005 Protection of Lawful Commerce in Arms Act has made such victories all but impossible, providing gun companies unique legal protections in many cases when they negligently sell or make a gun that ends up being used in a crime. The Milwaukee jury awarded over $5 million to the two police officers, finding Badger Guns responsible for the sale to a straw purchaser because the store knew or had reasonable cause to believe that the sale was illegal. The Brady Center, along with the law firm of Cannon & Dunphy of Brookfield, Wisconsin brought the lawsuit in 2010 on behalf of two police officers injured in the line of duty, Bryan Norberg and Graham Kunisch. Patrick Dunphy tried the case for the officers, assisted by Brett Eckstein. The African Bush Wars have always intrigued me. Whether it was in Rhodesia (now Zimbabwe), Angola, Mozambique, or South West Africa (now Namibia), you had Communist-backed insurgencies, guerrilla warfare, and effective counter-insurgency campaigns. It was kind of like seeing the Vietnam War set in southern Africa but without the massive involvement of the United States. Today I stumbled across a website that has a number of free e-books available for download. What makes it most interesting is that you have books from both sides. You have analyses of the impact of the Soviet and Cuban advisors, you have a book written by a Cuban about his perspective on the air war in Angola, you have many books from the South African perspective, and the list goes on. The website also has one of the most extensive collections of books on the African Bush Wars for sale. Bush War Books and the free downloads can be found here. The Brady Center won one this afternoon in Milwaukee. A jury decided in favor of the plaintiffs and against Badger Guns in a lawsuit that was supported by the Brady Center. The lawsuit accused Badger Guns of being negligent for allowing a straw purchase. The firearm purchased was later used to shoot two Milwaukee police officers. The jury awarded the police officers $5 million. The high-profile case, only the second of its kind nationwide, went to the jury of eight women and four men late Monday afternoon and deliberations continued Tuesday. They deliberated for nine hours. Officer Bryan Norberg and former Officer Graham Kunisch were shot by Julius Burton during a routine stop on Milwaukee's near southside in June 2009. A month earlier, Jacob Collins bought the gun at Badger Guns for Burton, who was too young to buy a handgun from a store. Burton paid Collins $60. Burton is serving 80 years while Collins already finished his two years in federal prison. Norberg and Kunisch allege in their 2010 suit that Badger Guns, its predecessor, Badger Outdoors, and the owners of both broke the law, were negligent in sales practices and conspired to keep the operation going when federal regulators recommended revoking the license. The case is the second to make it to trial since a federal law passed granting immunity to gun dealers and manufacturers. The law has exceptions, including allowing plaintiffs to sue if they can show evidence of illegal gun sales. The first such case to go to trial ended in victory for an Alaskan gun store his summer. The conspiracy allegation by Kunisch and Norberg is aimed at how the store went from being Badger Outdoors to Badger Guns in 2007. Badger Guns lost its FFL in 2011 for reasons unrelated to this straw purchase. According to a report on the case by Pierre Thomas of ABC News, the defendants do plan to appeal the verdict. Brady Center attorneys Jonathan Lowy and Alla Lefkowitz had been forced to withdraw from this case for violating Wisconsin Supreme Court rules of conduct for attorneys. UPDATE: A commenter on Facebook, Anthony aka The Packetman, pointed out quite correctly that the BATFE would have brought criminal charges against the owners of Badger Guns if they thought they had a winnable case. They didn't. It should also be pointed out that the standard of proof in a civil trial is much less than in a criminal trial. It only requires a preponderance of the evidence to win unlike in criminal cases which requires beyond a reasonable doubt. John Hockenberry, host of NPR's The Takeaway, interviewed Tom Gresham of Gun Talk last Thursday. The interview was polite if a bit contentious. The contentiousness came due to the closed mind of Hockenberry who, by the way, had interviewed Piers Morgan about guns the day before. Tom was asked to be on the show because he has the largest, nationally syndicated radio show devoted to guns in America. Tom discussed his interview on Sunday's Gun Talk. He noted that he spoke with Hockenberry for approximately a half hour while what was aired was less than eight minutes. During the interview the topic of the funding of "gun violence" (sic) research at the Centers for Disease Control came up. Tom said he wasn't opposed to funding research at the CDC if it wasn't done with a preconceived outcome. That is when Hockenberry equated guns with ebola. Tom responded, somewhat incredulously, "You are equating guns with ebola?" Hockenberry responded, "Guns kill. Diseases kill. It's a public health issue." I say all this by way of disappointment. I am a good, anti-gun liberal (who also grew up with people who used guns safely and sanely, and I do believe that is possible) but more and more I hear commentary like this: "Oh, I'm such a smart liberal who knows guns kill and you are some dumb hillbilly I can condescend to." It cheapens the debate and will never get us to a place of safety. Really sounded like Mr. Hockenberry let too much of Piers "Musket" Morgan rub off on him before interviewing Mr. Gresham. That was an incredibly unprofessional interview on Hockenberry's part and rather than discuss the points Tom Gresham was making (and he was stating facts) he devolved into some strange passive-aggressive theme where he anthropomorphized firearms and mischaracterized Tom's statements, demonstrating the Mr. Hockenberry was more interested in peddling gun control laws for their own sake rather than weighing the real merits and seeing why such laws do nothing that they are promised to do. Journalistic integrity is becoming a rarity, even on NPR. Tom LI: How can anyone seriously argue that the presence of a gun doesn't embolden certain personalities to use the device suddenly and emotionally..? Mary from Nor Cal: THANK YOU!!!!! You are one of the only honest, forthright and outspoken journalists out there. Thank you for your show! Regarding guns - handguns need to be banned. We are the only covalized county that allows gun ownership and it is long past time to change that. Moving beyond the show to Hockenberry himself, I find it interesting that for someone confined to a wheelchair since 1976 that he is so anti-gun and anti-self defense. I wonder what he would say to my friend Kurt Hofmann who, like Hockenberry, is a paraplegic confined to wheelchair. Kurt, gun blogger, the former St. Louis Gun Rights Examiner and current S.W.A.T. Magazine columnist, came to gun rights when he found that Illinois would not let him defend himself with a firearm outside the home. That would be an interesting conversation to say the least! I had the opportunity to sit down with some of the physicians involved in Doctors for Responsible Gun Ownership while at the recent Gun Rights Policy Conference. I was impressed by their dedication to gun rights and am glad that they are on our side. Last week presidential candidate and retired neurosurgeon Dr. Ben Carson hinted his possible support for the creation of a database of “dangerous people” to reduce mass shootings by preventing such people from gaining access to firearms. Dr. Carson further stated he does not oppose repealing the ban on federal funding for gun research at the US Centers for Disease Control and Prevention. Dr. Timothy Wheeler, director of DRGO, has released an open letter to Dr. Carson on these issues. 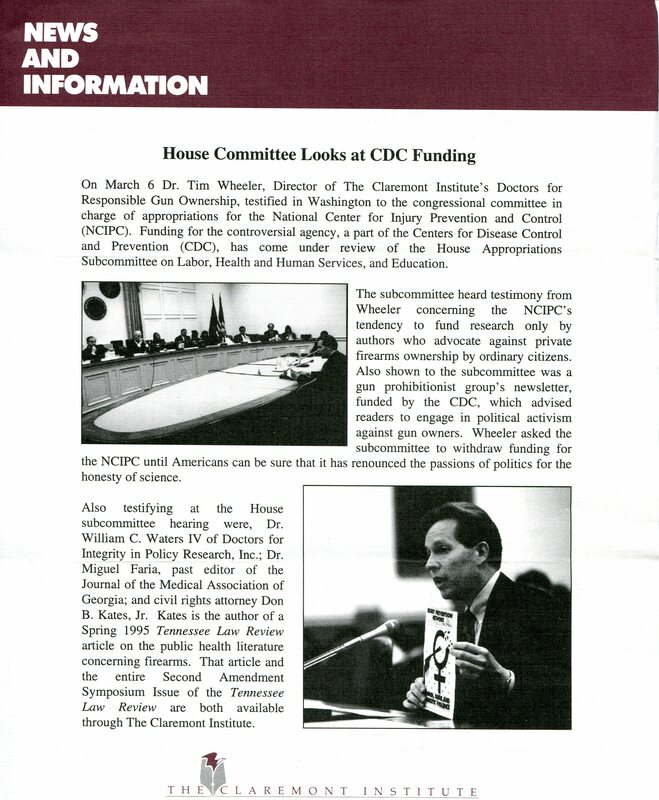 Dr. Wheeler was one of the physicians who testified before the House Appropriations Committee back in 1996 about the CDC's misleading research and its anti-gun advocacy. As a nationwide group of fellow freedom-loving health care professionals, we are glad to see your candidacy for President. We are gratified to have seen a change in your public statements on firearm policy since you entered the primary race. Along the way you have apparently become educated in the demographics and political philosophy of the American right to keep and bear arms. These are things your otherwise extraordinary career may not have prepared you for, and we thank you for making the effort to learn them. Still, your recent remarks supporting restoration of funding for gun research to the Centers for Disease Control and Prevention (CDC) make us wonder if you know why Congress reined in the CDC’s gun control research in the 1990s. Part of the mission of Doctors for Responsible Gun Ownership is to guard against biased, agenda-driven advocacy science that attacks the right of gun ownership under the guise of legitimate science. Unfortunately, gun control advocates at the CDC long ago assumed a central role in funding and supporting such advocacy science. And as you know, research motivated by a political agenda is not real science at all. The CDC funded research culminating in numerous medical journal articles. The articles invariably proclaimed gun ownership to be a public health hazard. The most controversial was “Gun Ownership as a Risk Factor for Homicide in the Home,” (New England Journal of Medicine 329, no. 15, October 7, 1993). Its authors claimed that keeping a gun in the home increased the risk of becoming a homicide victim. The authors incorrectly used a case control method to claim a causal relation between gun ownership and homicide risk. They improperly generalized from a highly selection-biased study group of inner city homicide victims to gun owners across the country, even in rural and low-crime areas. In an official 1993 CDC publication, Public Health Policy for Preventing Violence, senior CDC administrators proposed allowing only police, guards, and the military to have guns. As an alternative they proposed the outright prohibition of gun ownership (see page 19 of original document). We would not be surprised if you are unaware of the valid reasons for Congress’s defunding of CDC firearms research. Most major media outlets refuse to mention that history in their many protests about the defunding, since they are almost all unapologetic supporters of strict gun control. More detail on the history of Congress’s defunding of the CDC is available at DRGO’s website in the three-part series titled “Public Health Gun Control: A Brief History”. Broader commentary and documentation of the public health community’s deliberate campaign against gun owners is available at the website. We invite your critical review. And we wish you the best in the months to come. There seems to be a strong correlation between what comes out of the mouths of anti-gun rights politicians and rising NICS checks. Both President Obama and semi-presumptive Democratic presidential nominee Hillary Clinton have recently said they admire the Australian model. Translated this means the confiscation and destruction of those firearms they don't like which is the majority of firearms out there. The National Shooting Sports Foundation reported their adjusted NICS checks for September yesterday along with the third quarter 2015 statistics. Suffice it to say, they hit records for the highest month and highest quarters on record. 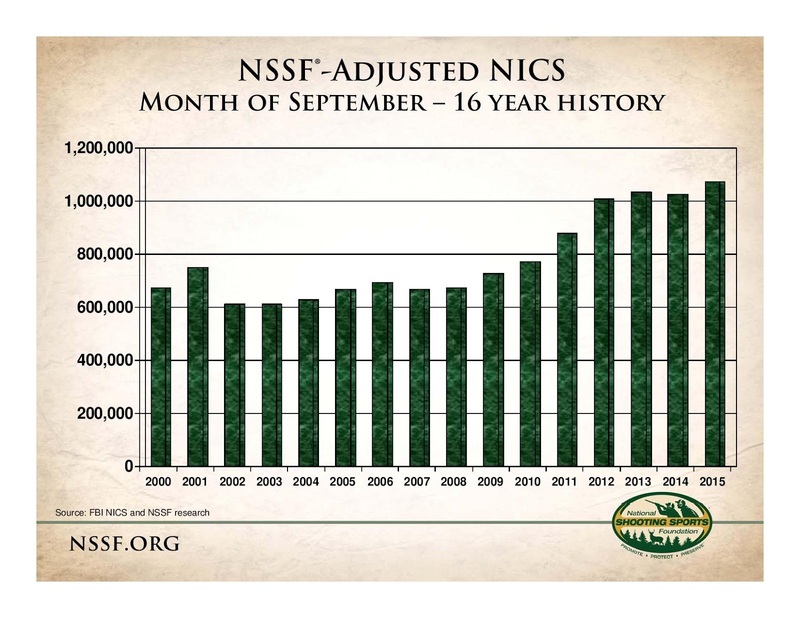 The September 2015 NSSF-adjusted National Instant Criminal Background Check System (NICS) figure of 1,071,945 is the highest September on record for the 17-year-old system, with an increase of 4.7 percent compared to the September 2014 NSSF-adjusted NICS figure of 1,024,272. For comparison, the unadjusted September 2015 NICS figure of 1,786,743 reflects a 23.4 percent increase from the unadjusted NICS figure 1,447,485 in September 2014. 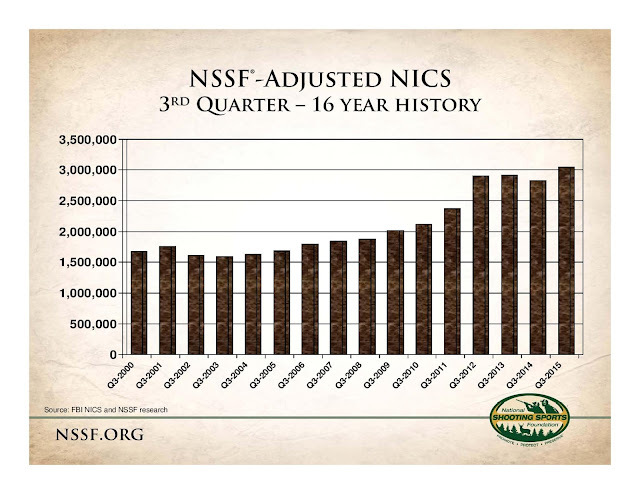 The third quarter 2015 NSSF-adjusted National Instant Criminal Background Check System (NICS) figure of 3,050,432 is the highest third quarter on record – a 7.8 percent increase over third quarter 2014. What impresses me about these statistics is that they have surpassed similar periods in 2013 which was the immediate post-Newtown surge. Beyond the political rhetoric I'm not exactly sure what is responsible for this growth. The attendance at the local gun show this past weekend did not seem extraordinary and the number of AR15s for sale seemed to be down. However, on a personal note, I did get a message from one of the Complementary Spouse's cousins asking for help in purchasing a firearm. He noted that he'd never owned a firearm but felt he should be armed. As always, these NSSF-adjusted NICS checks do not have a direct correlation with sales. Several states use the NICS system for the issuance and continued inspection of concealed firearm permits. Moreover, the CCW permits from many states can be used as a substitute for a NICS check. This said, the adjusted NICS checks do show sales trends and they seem to be trending up again. Is CAGV Afraid Of A Little Political Theater? From The New York Times, No Less.